In 2008, Center researchers seized a rare opportunity to quantify the results of conservation action on a large scale. 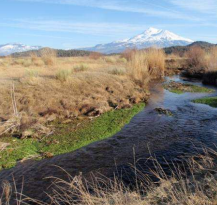 The Nature Conservancy bought ranchland along Big Springs Creek, a Shasta River tributary that had been degraded by cattle grazing. The conservancy continued ranching but fenced out cattle along the 2.2 mile stream. Since then, Center researchers and partner Watercourse Engineering, Inc. have been extensively monitoring the creek's recovery, collecting data and analyzing changes in geomorphology, hydrology, hydraulics, water temperature, water quality, aquatic vegetation, aquatic invertebrates, fish assemblage and habitat distribution. Provides valuable insights to large-scale restoration for salmon. Documents the importance of spring-fed streams as refuges for cold-water fish in a warming climate. Demonstrates how salmon can recover while maintaining a working landscape. Willis, A., & Deas M. (2012). Response to Restoration: Water Temperature Conditions in Big Springs Creek and Surrounding Waterways, 2009-2011.